MarketOne today announces the launch of Zero Touch Email for the Oracle Eloqua marketing automation platform. Once configured, the solution enables marketers to populate and push highly personalized emails to subscribers with zero effort. Zero Touch Email for Eloqua uses RSS (Really Simple Syndication) to push content held in a content management system – text, links and images – into a pre-configured email template, before automatically sending the email to subscribers at the desired or requested frequency – daily, weekly, monthly, or the moment new content is uploaded. 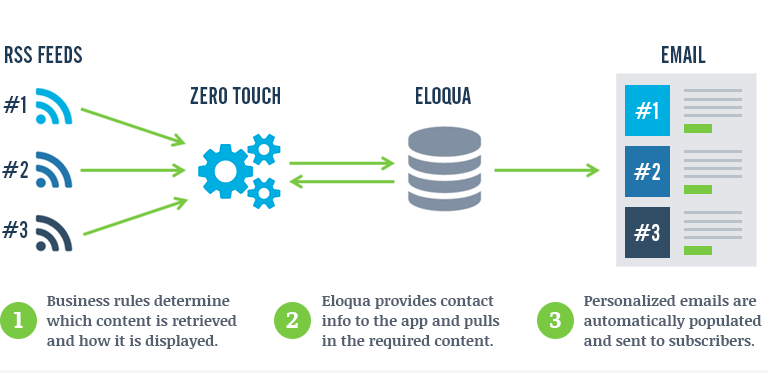 Unlike other RSS Cloud Connectors that exist for Eloqua, including Oracle’s native RSS application, Zero Touch Email can support one-to-many relationships between subscribers and the content they wish to receive. A single email can be populated with content from several different RSS feeds, depending on preferences stored in a contact field or using a data card lookup. For further information on pricing, or to get a demonstration of the solution, please complete this simple form, or chat to us on this page right now.